The Public Affairs and Marketing Network (PAMN) is a cooperative venture of academically based comprehensive, clinical, basic and consortium cancer centers as designated by the National Cancer Institute (NCI) or that are members of the Association of American Cancer Institutes (AACI) The Network works in close association with the NCI’s Office of Media Relations and Public Affairs to further public awareness of cancer research, prevention, detection and treatment. The Network was established to share information and resources among the communications and marketing professionals at cancer centers to enhance understanding of the nation’s cancer research effort; and to collectively address critical issues of common concern. The Steering Committee will consist of a minimum of 10 representatives with an upper limit to be determined annually by the Steering Committee. One representative will be from the cancer center that will host PAMN’s next annual conference. The Steering Committee also will include a liaison from the NCI’s Office of Communications. Two people from the same organization can be voting members of the steering committee, with the stipulation that one person is the Treasurer. The Steering Committee should maintain an “odd” number of committee members for voting purposes. Except for the representative of the cancer center that will host the next annual conference, members of the Steering Committee will be elected to two-year terms by a majority vote of all Network members. If for any reason committee membership drops to fewer than six, the Steering Committee will add at least two members for an interim term until the next annual meeting. Steering Committee terms of office will be staggered for the purposes of continuity. The outgoing chair may serve two years on the Steering Committee after his/her term of office. Officers will be elected annually by the Steering Committee following the general election. A chair will be elected to a two-year term. The incoming chair will recommend a vice chair to be voted on by the Steering Committee. The vice chair serves a two-year term. The Steering Committee will meet two or more times a year in addition to the annual meeting to accomplish Network business. Steering Committee members must attend the annual meeting and at least one other meeting to retain their Steering Committee membership. Other responsibilities may include keeping Network members apprised of new developments and programs and working on special projects and initiatives. The Steering Committee will appoint additional individuals, in addition to its members, to a planning subcommittee for the purpose of organizing the annual conference including programming and sponsorships. Members of the planning subcommittee will participate in Steering Committee conference calls and meetings and be included in Network discussions but only Steering Committee members may vote on policy decisions or other business not directly related to the annual conference. Subcommittee members will include but not be limited to previous, current and future conference hosts. Subcommittee members may represent institutions already represented on the Steering Committee. Subcommittee members may include individuals outside the Network, if recommended by a Steering Committee member. Subcommittees of the Public Affairs and Marketing Network are open to all members. Each subcommittee is led by one or more steering committee members. In addition to the following subcommittees, the steering committee plans the annual meeting each year at the host location. We welcome input and assistance from general members in planning the annual meeting by suggesting session topics, workshops and speakers. If you or someone you know is interested in joining a subcommittee, please email publicaffairsnetwork@gmail.com. We welcome any cancer center that is designated by the National Cancer Institute (NCI) or is a member of the Association of American Cancer Institutes (AACI). If your cancer center isn’t listed below, email us at publicaffairsnetwork@gmail.com about becoming a member. 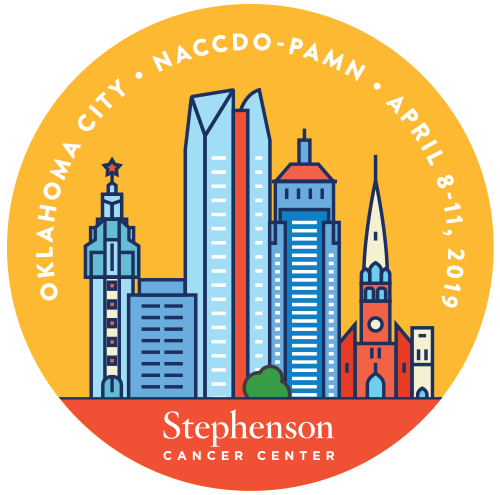 The Stephenson Cancer Center looks forward to welcoming you to Oklahoma City as it hosts the 2019 NACCDO-PAMN Annual Conference!